I'm almost ashamed to show you my second quarterly update of my TBR Bingo card. Last quarter, I'd read five out of 36 books, and this quarter I've read 10. Ouch. My excuses are the same as they were last time around: I've been reading long books and book club books. The Golden Bowl took me forever. My current reads are both over 800 pages long. (To be fair, one of them is a trilogy bound in one volume, and we'll see how far I get into it.) 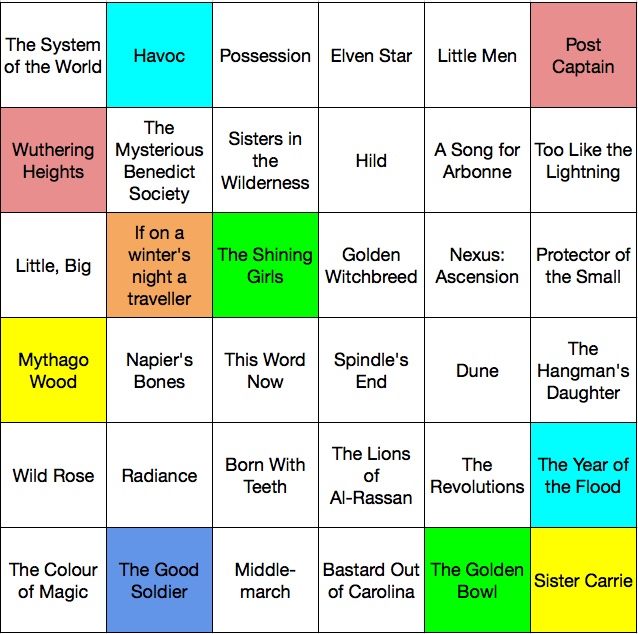 I've now run out of List books on the bingo card, too, meaning that my progress next quarter will be even slower. I'm not even sure I'll manage to get a bingo at all this year! 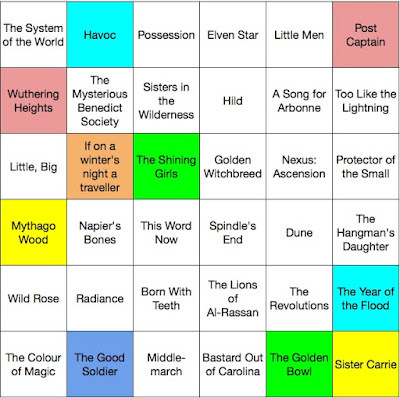 Lesson learned for a potential TBR bingo next year: dedicate some spaces to book club books. You can find my previous TBR Bingo Update here.